Also located in the central of Vietnam, the Vietnamese people in Danang and Hoian are totally different. They are nicer and more friendly. You will feel safer in Danang and Hoian. However, there are bad people everywhere in the world as one traveler was requested to pay 50 pound for 1 hour rickshaw in London city in Britain. Here is also no exception. You may be cheated by taxi drivers, motor-bike taxi dirvers, small restaurants. It is very rare here,. But it may happen. If it happens, please call hotline: In Danang - +84. 511.1022 or +84.511.3550.111 In Hoian - +84.510.3666.333. We know you will not have to phone these numbers. Welcome to Danang city,the gate way to 3 World UNESCO Cultural Heritage Sites in Vietnam. Danang is the land of stunning landscape and challenging myths. It is also the land of smiles, generosity and hospitality. However, like anywhere in the world, there are both good and bad people here. We would like to give you some travel tips and tricks to make your holidays in Danang unforgettable. How to travel to Danang: There are many daily flights from Singapore, Bangkok - Thailand, Kuala Lumpur - Malaysia, Siemreap - Cambodia, Hongkok to Danang. If you are in Vietnam, there are many ways to travel to Danang: by car, bus, train, airplain. If you have very tigh budget and want to travel by local bus, there are at least one bus station in each city. However, you had better think of the traffic in Vietnam. The bus is often overloaded and there are many acciedents in Vietnam, killing about 11 000 people in a year in our country. The train is better, but it will take longer time because it stops in many station. Travel to Danang by car is great idea, but by airplane is the best. When is the best time to travel Danang: The best time to visit Danang is from Jan to September. It is the dry season. It is a great idea to spend a couple of days relax on white sandy beach with emeral water from March to August. From September to Discember, it is rainy season, but it is still nice to explore the city. Which cruise on Han river should you join? This is a part of an Vietnamese article about river Cruises on Han river in Danang. You can find this Vietnamese sentence on Vietnamese Policement newspaper: "đa số các tàu thuyền du lịch là các tàu đánh cá được sửa chữa, làm mới, hoán đổi công năng - tức là chưa đạt chuẩn tàu du lịch." in this link The Undevelopment of Danang river cruises. This sentence means most of cruises on Han river are amended fishing boats - this means they do not satisfy tourism-standard requirement. However, there are some good cruises on Han river. The best cruise in 2015 is "Tau Rong Song Han" - Han River Dragon Cruise. This tourist boat is 28m long, 10m width with 2 restaurants and 1 bar on the top floor. This cruise can fit 250 tourists. The cruise's first trip is from 18:00 to 19:30 and the 2nd trip is from 20:00 to 21:30. We strongly advise you to join the 2nd trip. This is because at 21:00 you can see the Dragon spits fire at the Dragon bridge. The cruise also offer dinner. If you want to have a romantic dinner on this cruise, you should book before. We recommend you join this cruise if you stay in Danang. The dock for this cruise is opposite the Cham Museum. Ba Na hills: Should you go to Ba Na hills? Every Vietnamese tourists who have summer holidays in Danang would like to go to Ba Na hills. Why? There are 2 reasons from Ba Na hills: 1st reason, but not most important - most Vietnamese people have not been to France where they can see some French architectured villas, offering nice photos. 2nd reason - coming from second part of Ba Na hills. There are 3 levels of games for kids. These groups want to go and their parent are persuaded to go with them. If you come from Thailand, Malaysia, Singapore... or join the games from these countries during your trips there or if you are not teenager, you should think twice whether you should go to Ba Na hills or not. This means: you will not know what Ba Na is if not been there. Been there, you said it is better to stay at home. If you come in the hight season of Vietnamese from May to September, you should go by taxi or private tour and you will be the 1st person there, join the cable car. You will have more time to see and play the games. If you join open tour and come late, you will have to wait for everything from cable car, train, and the games. Who will you travel with: Another thing, you should know that it is open tour and you will see different tourists pay different price. Please do not be surprised if you find out this problem. You should not complain and call your travel agent. It won't help and cost you more for the phone call. The travel agent will sell theBa Na tour package with tour guide, bus, food and it is not included train ticket to go up the mountain for 1.7 minute - cost 70.000VND and the ticket to Sap museum costs 100.000VND. In the museum, you will see some of the famous persons made of special martial sand look like the real person in life. This is the way to make the cost of the trip seems to be cheap. But, it is not cheap. We strongly recommend you to travel to Ba Na by yourself if you do not to go by private tour package. What to eat in Bana? The buffet is very normal. The taste is so so, but it hygienic. The whole area belongs to the investor, so if you do not want to join their buffet, you should prepare your food before. If you go privately, you can go back to Da Nang city for lunch. See and experience Danang in a different way with helicopter tour for around 12minutes to 15minutes. The travel route starts at Nuoc Man airport - Ngu Hanh Son(5 marble mountains) - Dragon bridge - along Han river - Son Tra penasiana - Large Buddha statue at Linh Ung pagoda - Along the beaches - The airport(minmum group of 5persons). There are many restaurants along My Khe beach. However, you should not take taxi there, the driver will ask the restaurant to pay them commissions. Our trick is you still take the taxi to the restaurant and go a little further. Then, get off the taxi and walk back 2 minutes. The taxi driver goes away and do not know which one you come in. Be man restaurant, sea food 27 restaurant, phuoc Thai restaurant - ho nghienh road is good and reasonable. For 2 person, 20 usd/person, you will have a quite good seafood lunch or dinner. This will cost you over hundred dollar in the west. Welcome to Hoi An, a really charming, ancient town in the central of Vietnam - a must-see destination on Vietnam travel. 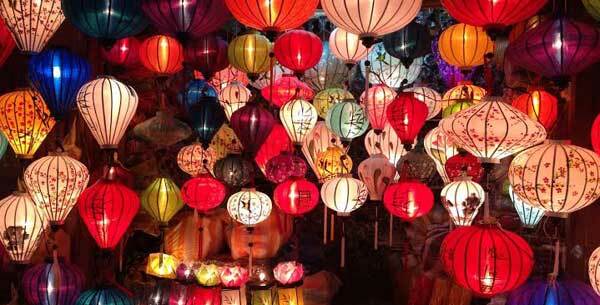 In the 16th & 17th centuries, Hoi An was an international trading port Asia. A big number of foreign ships from Japan, China, India, Dutch came to Hoi An for annual trade fairs which lasted from 4months to 6 months. Therefore, the damanding to stay in this town for the traders increased and they built their own quarters for long living. Thanks to these opportunities, the ancient Hoi An town with unique and various forms of architectural monuments such as assembly halls, communal house, temples, pagodas, shrine, water wells, market, bridge.... especially living house - a great combination of shop and living into one house. Luckily, these monuments have been well preserved, showing travellers here a really good example of symbolic Oriental city in the Middle Age. Hoi An ancient town is now famous as a living museum of urban lifestyle and architecture with the old aged cultural habits and customs. Due to its unique features, UNESCO put Hoi An on its membership list on 4th/12/1999. 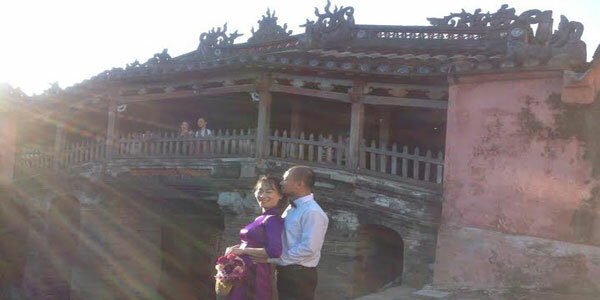 Best Time To Tour Hoi An is from Feb to April. It is not hot or cold and not rainy season. From May to July, it is hot and sometimes very hot. However, it does not matter because the best time to tour Hoi An is the afternoon and at night. Come to Hoi An without walking around this ancient town at night time, it means you will miss 80% of the charm from this ancient town. From Sep to Dec, it is rainy season here, but it is stil nice to tour Hoi An. It is because the rain normally happens for half an hour or an hour and it stops. 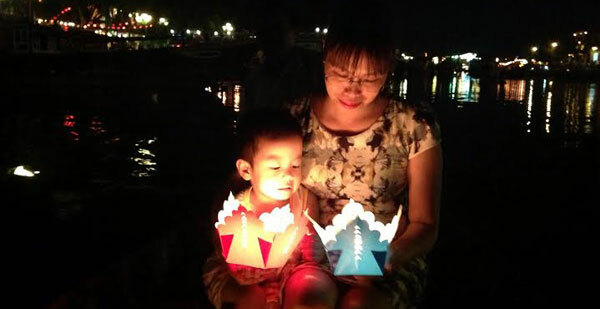 Try to come to Hoi An on the 14th of the moon calendar for a lifetime experience. On this night, every house have latterns lit in the front of their house, offering so wonderful photos. How to travel to Hoi An: By airplane and train, you will get to Danang city - 30km north of Hoi An and it takes about 40 minutes drive to get to this town. From Hanoi and Saigon, there is daily open bus, but it is not a direct bus. From Hanoi, the bus will stop in Hue. From Saigon, the bus will stop in Nha Trang. Both will arrive in the other city in the morning and continue to start its journey in the evening. However, it is good idea to combine your city visits. How to travel around Hoi An: The best way to see Hoi An ancient town is by walking or by bicyle. Every day, the town is closed for moto-bikes from 8:00am to 11:00am and 15:00pm to 21:30pm because these times are best to walk. This town is not too big. Stay in Hoi An town or on the beach: It is a difficult decision for many travelers to Hoi An because they have heard that it is worth to explore both. With us, a local tour operator, it becomes so easy. 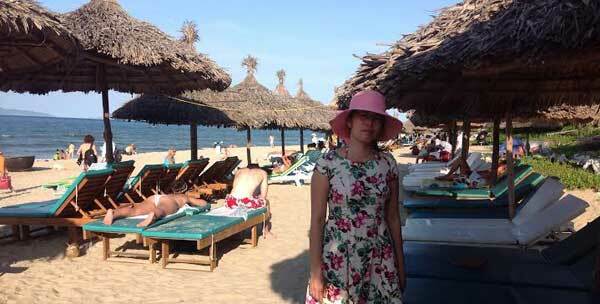 If you travel Hoi An from the middle of April to the end of August. It is really nice to stay in a nice resort on the beach for 1 or 2nights. If you have 3 or 4 nights, we strongly advise you to stay both areas - on beach and in town: Just a little time for packing, but it is so nice to walk around the ancient town from 5pm to 10:30 and taste wonderful street food and local drinks. The weather and temperature at this time of the year is hot. So daytime it is so nice to relax on the beach and from 4pm come in town of Hoi An to explore the ancient town at night time. However, if your Hoi An package tour starts from September to the beginning of April. We definitely advise you to stay in Hoi An town or at some of the nice resorts on the bank of Thu Bon river about 5 minute walk to the ancient town of Hoi An. At this time of the year, it is cool weather and sometimes rainy, so it is no point to stay on the beach. But, it is the best time to explore Hoi An. You may say I am a mad person to advise you to tour Hoi An this time because of the rain. The rain happens here for a half an hour or an hour. It is rare to have typhoon during Norvember and Discember. Stay in the town, but want to go to the beach: If you stay in the town and want to go the the beach, you can go by bicyles, moto-bikes or taxi. From the town to the beaches, it is 5km. There are 2 beaches: Cua Dai & An Bang. We strongly advise you to go to An Bang beach. It is much more beautiful than Cua Dai. There are no hotels, resorts in An Bang beach. It is a big, pure and white sandy beach with emerald waters. There are many local seafood restaurants here where you can hire the bed for sunbathing. Where to eat if stay on the beach: Do not take taxi from town and your resorts to the restaurants on Cua Dai beach because the restaurants have to pay taxi driver money. And of course, you have to pay higher. If you eat seafood, you can see the alive seafood before they cook it. The restaurants in Cua Dai is more expensive that the restaurants in An Bang beach. Where to eat if stay in Hoi An: It is so convinient to eat in Hoi An town with many nice restaurants. From any point in this town within 5 minutes of walk, you will find a restaurant. However, if you do not want to be a tourist while touring Hoian, join with our tour guide to taste the real and wonderful local tastes. A must-taste on Hoi An tour is Khong Gian Xanh - Verdant Space. It is a little local restaurant, offering seats for 35 persons. It is located in a small lane/ 687 Hai Ba Trung - Hoi An. Tel: 0510 3861 984. Moblibe: 01294046121 - 0935787219. In this restaurant, you can try Cau Lau, Bun Thin Nuong, Hen Tron, Banh Trang Dap, Thit Nuong Cuon Ban Trang, Tre Bap. All is a must-taste. 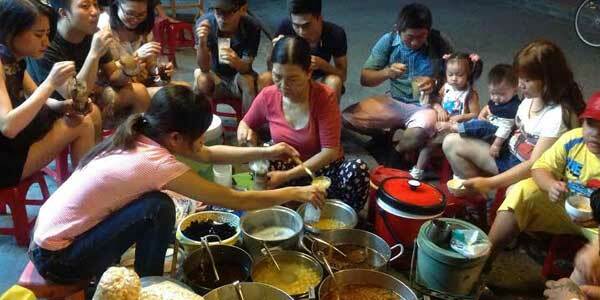 Probably, it is one stop for your meals during your Hoi An travel. 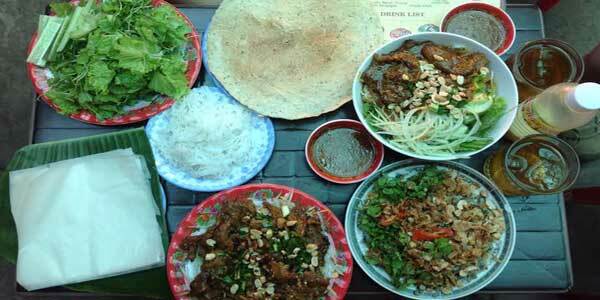 Com Ga Hoi An - Chicken with Rice: It is probably the most popular Hoi An food. Everyone wants to taste this food. However, in our opinion, it is not as good as Bun Thit Nuong, Hen Tron, Thit Nuong Cuon Ban Trang... Com Ga Ba Buoi in 22 Phan Chu Chinh is so popular with travellers to Hoi An. However, it is now run by her children and their taste is not as good as that from Com Ga Ba Nga - Add: 08 Phan Chu Chinh. The Chef - Nice view of Hoi An: Located in 166 Tran Phu street of Hoi An ancient town, it is probably not the best place for food, but the best place for a cup of coffee to see the sunset and the ancient town at night. The bar is on the top of 3 floor building and you will see the whole view of the ancient town. Danang is a seaport city under the central goverment control. It is 942km2 with a population of 684.131. Danang has 5 wards: Hải Châu, Thanh Khê, Sơn Trà, Ngũ Hành Sơn và Liên Chiểu; 2 districts: Hòa Vang and Hoàng Sa. Danang is 760 km from Hanoi and 963 km from Ho Chi Minh city. Danang has an international airport, train station and international seaport. Before 1403, Danang belonged to Champa Kingdom of the Charm people. In 1403, Ho Quy Ly, the King of Dai Viet now is Vietnam, fought the Champa Kingdom and took Quang Nam province including Danang land. In 1858, the French invated Danang of Vietnam( 1859 Invated Saigon). In 1888, Paul peau, a French governer, decided to form and build Danang city and seperated from Quang Nam province. In the 19th century, as Hoian trading port came down, Danang city has become the main trading centre and the main trading port for the central Vietnam. Danang city became a logistics base for the French and American in the war invating Vietnam. American army built a modern militery airport in Danang for B52 planes, a modern Radar sysmtem on Son Tra mountain. Danang was the 1st place in Vietnam being invaded by both French and American.